McGathy's (often pronounced McGaffey's by old toothless fishermen) Hooks is a family owned/operated business that hand crafts a line of Hard Bead Spoons here in Michigan. Their line of spoons comes in several shapes and sizes are referred to as Slab Grabbers. 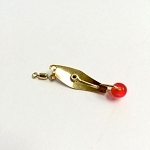 Bead spoons are extremely effective at attracting and catching schooling fish such as perch and crappies. They are fished a lot like vertical jigging a blade bait. Slab Grabbers are made from either Stainless Steel or Brass (drain pipe). The Drain Pipe material is highly sought after for its heavier weight in deeper water applications. Drain pipe material is still hand cut as it was decades ago...All Slab Grabbers have a bead on the hook to entice the fish to strike and keep them from getting completely impaled on the hook. That means quicker unhooking of fish and faster deployment to hold schools under your ice fishing hole.